1.4 cu. ft. capacity Provides ample space for food and drinks. Full-range control Allows you to adjust the temperature to suit your cooling needs. Wire shelf Offers sturdy support. Rounded, reversible door Can be fastened on the right or the left for ideal placement. 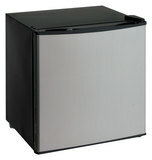 Convertible design Enables you to utilize the refrigerator as a freezer for frozen goods. Freestanding design Along with a flush back and recessed handle provides flexible placement options.